The Space Saver plinth heater offers increased flexibility and space in kitchen design as it enables the removal of radiators that may be using up valuable wall space. Fitting discreetly into the plinth of a kitchen, the Space Saver provides efficient and effective heat at low level, creating space for extra cupboards, more work surface and additional appliances. Highly energy efficient fan convector that fits neatly into the plinth of a kitchen unit. A Space Saver eliminates the need for conventional radiators. And, as its name implies, this brings considerable space saving benefits - more room for extra storage units, more work surfaces, more space for kitchen appliances. Space Saver is used predominantly for domestic applications where the ingenious plinthmounting feature makes it ideal for heating kitchens and utility rooms. Plinth mounting also makes Space Saver ideal for certain non-domestic applications such as reception areas, changing rooms, libraries, etc. All models are supplied with a detachable grille which is ; Zinc Coated steel polyester, powder coated - metallic silver (referred to as Brushed Steel). Only SS5 , SS7, SS9 and SS80 come with flexible hoses in the box. Eliminates the need for a wall mounted radiator freeing up valuable wall space for additional appliances, units and work surface. Sits neatly in the plinth under a kitchen unit. 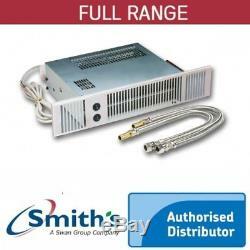 Available in a range of outputs suitable for heating different sized kitchens. A variety of fascia grille finishes including stainless steel, white, black, brown, chrome, aluminium and gold are available to complement any kitchen design. Available in hydronic (hot water), all-electric and dual fuel versions. Low voltage model for bathrooms and other high humidity areas also available highly energy efficient fan convector that fits neatly into the plinth of a kitchen unit. This is also the most safest and secure way as well. You can also pay using all major credit and debit cards by using this service as well. Goods as described, price competitive +++. Perfect thanks, easy to fix up and now I'm glowing. The product must be uninstalled, unopened and free from damage or misuse by the customer. If you are unable to do this any damage must be reported to us within 24 hours of receipt of goods, as this enables us to make a claim against the couriers. Any transit damages not reported within 24 hours after receipt of goods will not be replaced. All our items are in stock and ready for dispatch from our UK warehouse. We aim to answer all emails and messages within 24hrs if not earlier. Feedback We take feedback very seriously, if you are about to leave a negative please contact with us before entering it. Please give us a chance to resolve your problem and get in contact with us. Heated Towel Rails for Central Heating from. Eterna Kitchen Plinth Heater 2.4KW. 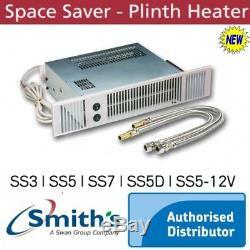 The item "FULL RANGE of Smiths Under Cupboard Plinth Heater Kitchen Space Saver Kickspace" is in sale since Monday, March 12, 2018. This item is in the category "Home, Furniture & DIY\Heating, Cooling & Air\Space Heaters". The seller is "search4goods" and is located in London. This item can be shipped to all countries in Europe.